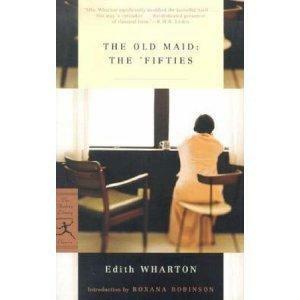 Years ago, I spent a summer reading every Edith Wharton novel I could get my hands on. She remains one of my favourite American authors, and so I was rather surprised to pick up an unread Wharton novel and discover that I felt lukewarm about it. Glimpses of the Moon (great cover btw) covers some of the same sort of territory as The House of Mirth–considered to be one of Wharton’s finest novels, and you won’t get any argument from me about that. The House of Mirth gives us one of Wharton’s/literature’s greatest tragic heroines, Lily Bart, a penniless young woman addicted to luxury who leads a parasitic life by being ‘useful’ to the wealthy set. Lily is a complex character who knows she needs to marry for money but is attracted to Lawrence Seldon, a man who cannot offer Lily the lifestyle she wants. Lily effectively manages to self-sabotage opportunities for security, and if you’ve read the novel you know how it ends. In Glimpses of the Moon we find a similar sort of set-up, but the novel seems superficial in comparison, and perhaps I would have enjoyed Glimpses of the Moon more if I hadn’t already been blown away by The House of Mirth. The House of Mirth was published in 1905 when women like Lily had few choices. 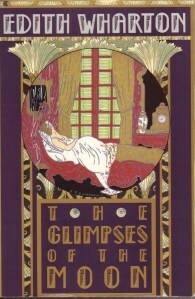 Glimpses of the Moon, however, was published 17 years later in 1922 and Wharton shows us an entirely different world. 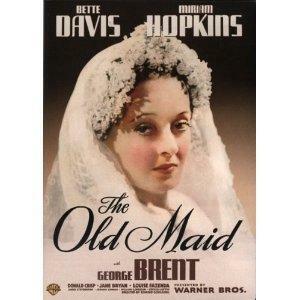 The House of Mirth still seems decidedly 19th century whereas Glimpses of the Moon is set in the giddy Jazz Age. The lack of choices Lily Bart faced are also in front of Susy, the female protagonist of Glimpses of the Moon. In Susy’s case though the ‘marry wealth’ or work decision doesn’t seem so dire, so desperate (there were more professional opportunities in the 1920s for women), so while Lily’s agonizing dilemma seems real, Susy’s dilemma seems more superficial. This impression is only fed by the superficiality of Susy’s character. Susy’s plans begin to falter when she meets Nick Lansing, a young writer, at a dinner party. After an initial attraction, they begin seeing one another casually until Nick’s wealthy, married, petulant , jealous “patroness,” Ursula Gillow demands that the relationship ends. Susy made no answer. How could she, when she thought? The dress she had on had been given her by Ursula; Ursula’s motor had carried her to the feast from which they were both returning. She counted on spending the following August with the Gillows at Newport…and the only alternative was to go to California with the Bockheimers, whom she had hitherto refused even to dine with. Susy and Nick marry on an impulse after Susy dreams up a “plan” which includes the promise that “whenever either of them got the chance to do better he or she should be immediately released.” Her intention is to live off of gift cheques and expensive wedding presents while moving through a series of splendid houses (complete with servants) ‘lent’ for the honeymoon, estimated to last at least a year according to Susy’s calculations. In the meantime, Nick is hoping to write a novel and begin a writing career that will perhaps support them both. With Susy’s plan of a year-long honeymoon, they gain a sort of reprieve, a time-out while enjoying the comfort of luxury paid for by others, but they will seem to be independent and they will have a “romantic and jolly” time. It’s a sort of no strings-attached arrangement, and the plan enables Susy and Nick to live off of their rich “friends” while appearing to be independent and leading their own lives. I suppose that if you are a giddy young thing with no real thought for the future, no ties or obligations, and you don’t mind using your rich acquaintances for their cheques & their luxury villas, it’s not a bad plan, but at the same time it’s easy to see how problems will rise. It doesn’t take long for something troubling to occur. Nick and Susy are staying at a villa at Lake Como owned by their friend Streffy before they move on to Venice, to the palace owned by the Nelson Vanderlyns. Two incidents occur which set a sour note on the relationship: 1) Susy decides to pinch a box of cigars from Streffy’s villa and 2) Susy becomes unwittingly embroiled in a plot to cover an adulterous assignation. Both of these incidents unsettle Nick and disrupt his relationship with Susy. Nick is made uncomfortable by Susy stealing the cigars, and he’s even more uncomfortable about their involvement in the adultery cover-up, and these seemingly insignificant incidents led to a break down in communication. It’s Splitsville for Susy and Nick with Nick taking the moral high ground and Susy wondering if she’s done the wrong thing in marrying Nick. Perhaps she should have held out for the big bucks. Then opportunities arise for both of them…. Ah, the loneliness of never being able to make him understand! She had felt lonely enough when the flaming sword of Nick’s indignation had shut her out from their Paradise; but there had been a cruel bliss in the pain. Nick had opened her eyes to new truths, but had waked in her again something which had lain unconscious under the years of accumulated indifference. And that re-awakened sense had never left her since, and had somehow kept her from utter loneliness because it was a secret shared with Nick, a gift she owed to Nick and which, in leaving her, he could not take from her. It was almost, she suddenly felt, as if he had left her with a child. Nick’s moral fastidiousness seemed a little unbelievable and hypocritical given that he’s married Susy on the promise of a year-long holiday at others’ expense, and as a result, the reasons for their split seem artificial and forced–a storm in a teacup. Second tier characters in this jaded social set such as “baleful enchantress,” Violet Melrose, artist’s wife Mrs. Fulmer, and Nelson Vanderlyn seem far more interesting people than the rather bland Nick and Susy who are supposed to be driving the drama. Wharton’s frequent theme of society’s powerful grip on the individual especially on the subjects of marriage, morality and individual freedom don’t quite work as well in this later novel. Given the subject matter, it’s impossible not to compare Glimpses of the Moon unfavorably to The House of Mirth. If I hadn’t read and reread The House of Mirth before arriving at Glimpses of the Moon, a much more superficial and less polished novel, I’d feel that the House of Mirth was the much later product of Wharton’s career. I suppose this is an argument for saving the masterpieces of an author’s body of work for the last.